The small and thin front wheels on a wheelchair or stroller might roll easy on hard surfaces, but on snow and ice they sink right in like a hot knife through butter. 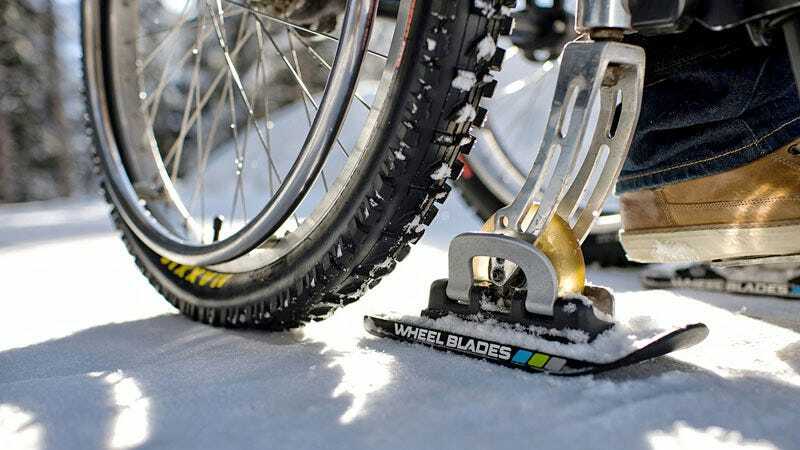 So a Swedish inventor has created a simple ski accessory that lets smaller wheels easily slide over frozen conditions. The Wheel Blades—created by Patrick Mayer—easily attach with a simple one-click operation to a mount that's cleverly engineered to accomodate wheels in a variety of sizes. The mount is also located closer to the front of the ski so each blade is always pointing in the direction the rider, or the pusher in the case of a stroller, intends. And a set of grooves on the underside helps provide stability as they're pushed through the snow. The Wheel Blades are expected to be available sometime in the fall of this year for around $245 per pair—but first Mayer needs to raise around $88,000 for an initial product run to bring the per-unit cost down. So he's created a donation form on his site if you'd like to contribute. Just keep in mind these aren't designed for tackling an Olympic-class slalom run in your wheelchair. Or even the bunny slope for that matter.